A clean home or business is a crucial part of anyone’s life, and it’s our goal at Spotless Cleaning Services to make sure it’s a part of your life in whatever capacity you need it. That’s why all of our professional cleaning services are tailor-made to your specific needs. Large corporate offices and small residences; intensive one-time cleanings, or weekly or monthly recurring cleanings—we aim to make sure that all our clients receive the Miami Shores cleaning services they need. No more, no less. As a Miami Shores cleaning company, all of our products adhere to local health regulations. It’s important to us that we use only safe, eco-friendly cleaning products so that you’re as safe and healthy as possible. We also offer additional or alternative products in case anyone in your building or family has any special considerations, such as allergies or immune system complications. Call to schedule a cleaning today and let us find exactly what you need to maintain a cleaner, happier home or business. Maybe you’re busy and it’s difficult finding time to clean, or stress leaves you with little enough time to relax without the worries of maintaining order. Or perhaps mobility issues make cleaning more difficult than it used to be. Whatever the case, our Miami Shores cleaning company is ready to help you make a clean home a regular part of your life again. We offer monthly cleanings for clients who need a bit of a boost every weeks. Or if you have trouble staying on top of your chores, we can be there once a week. Maybe you’ve just gotten behind and need a little pick me up! We’re available for a one-time intensive cleaning to get you back on track. Our Miami Shores housekeepers are all about the details, so you can expect everything to be cleaned, down to your floors, baseboards, and walls. We can also steam clean any drapes, which often go overlooked. Drapery often can’t be machine washed, and it can collect enough dust to irritate the lungs, especially if anyone in the household has any respiratory disorders. Schedule your cleaning today and we’ll show you what a difference it can make! Renters and landlords can both benefit from professional Miami Shores cleaning services. Renters leaving a property can avoid suffering hefty penalties for leaving it in unclean conditions. Our professionals can perform a one-time deep clean to ensure you aren’t charged for details you might overlook. Likewise, property owners may find it difficult to rent or sell a property that isn’t in pristine condition. Spotless Cleaning Services can revitalize a property so that it once again feels brand new. Our Miami Shores cleaning services also frequently help with vacation rental properties. With our cleaning services, you’ll be able to maximize your rental time by minimizing your cleaning time. Let our Miami Shores cleaning company save you both time and money by scheduling a cleaning today. A clean place of business is crucial to any company, but with so many employees and different work-spaces, it can be hard to stay on top of. Our Miami Shores cleaning service is equipped to deal with any kind of commercial space. We’ll use industrial strength products and procedures to make sure your building is as clean as it can be. Looking for professional maid services in the Miami Shores, FL area? We’ve got you covered! 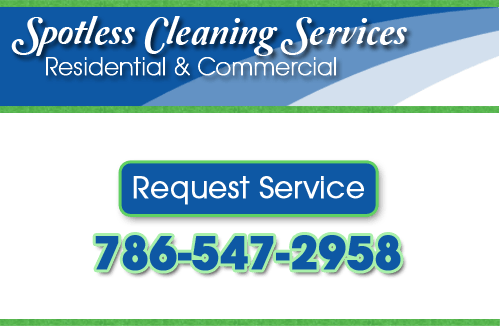 Call Spotless Cleaning Services today at 786-547-2958, or complete our online request form.